Carbery’s range of plastic road salt storage bunkers, are ideal for the on and off-highway storage of grit during the winter months. Manufactured from premium grade polymers, Carbery grit bins possess excellent impact resistance properties, at even the lowest temperatures. Meantime, inbuilt UV stabilisers, ensure Carbery road salt bins are protected from the damaging effects of sunlight. So come rail, hail, sleet or snow, you’re assured that Carbery road salt bunkers will provide many years of reliable service, whatever the weather. Finished in a bright yellow colourway, for ease of use, each grit bunker incorporates a wide top entry / discharge hatch. A bottom discharge door available is also available as a product option on all road salt bins – just specify at time of order. This grit bunker can be supplied with an optional bottom door – just specify at time of order. Subject to minimum order volumes, Carbery road salt bunkers can be supplied complete with corporate logos and product information. These can be applied via either self adhesive labels or permanent, mould on graphics. 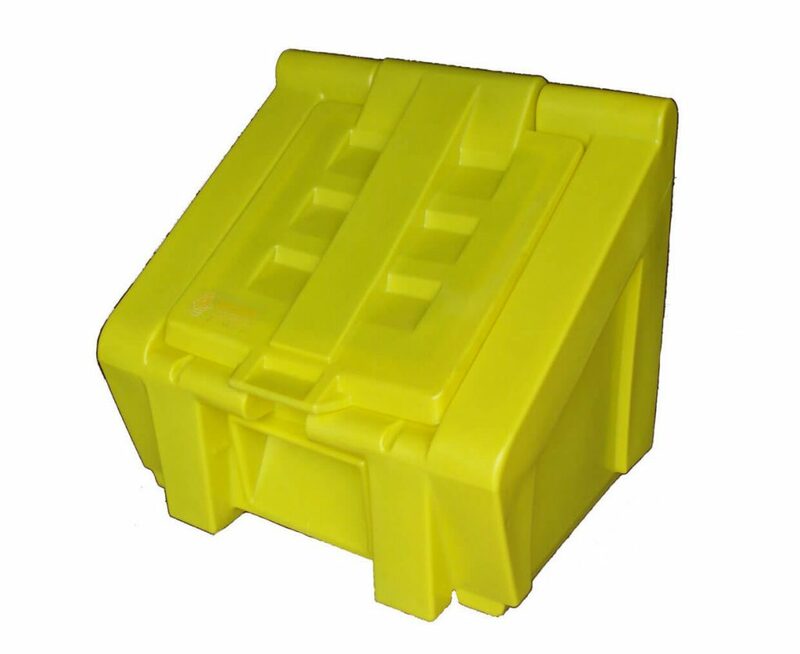 To ensure the security and integrity of stored product, a lock can also be supplied with all Carbery grit bins upon request.